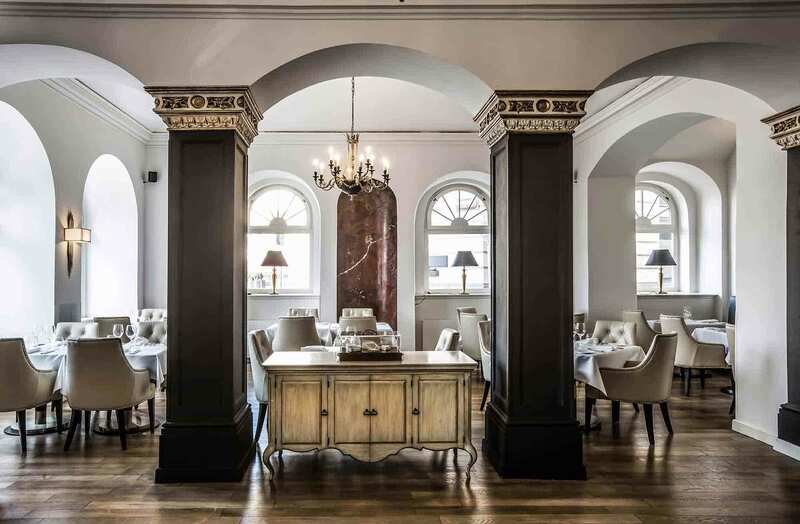 Inside the stately Smetana Hotel, overlooking the river and Charles Bridge, lies the Michelin calibre restaurant Atelier Kalina, a fine dining institution that prides itself on delivering first-class ‘new-Prague cuisine’. 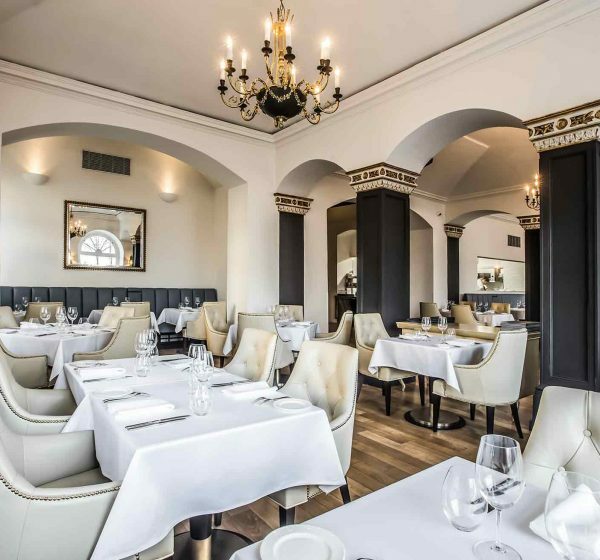 With a head-turning open-kitchen set against a majestic backdrop of beautiful whites, royal blues, deep browns and golds, with chandeliers and ornate furnishings to rival the baroque palace’s, this is an absolutely stellar foodie experience perfect for relaxed lunches, dates, celebratory meals, and more refined business matters. 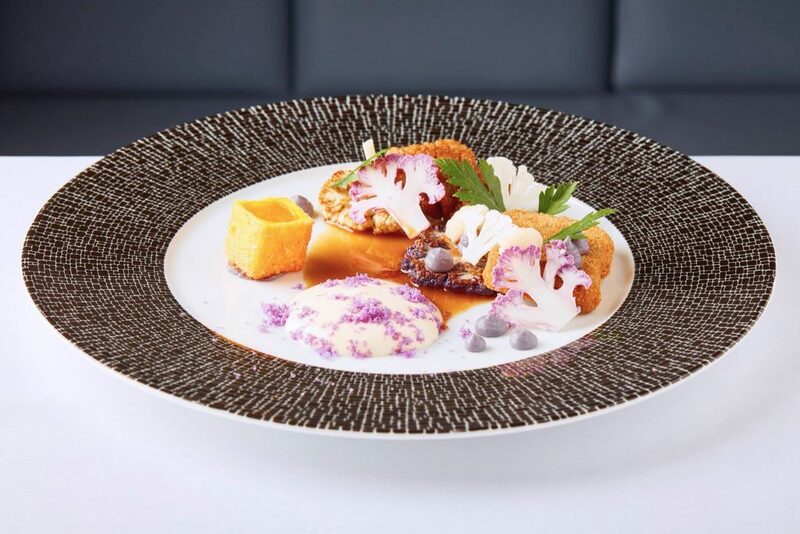 Named after its Head Chef, somewhat superstar MasterChef Mirek Kalina, who holds an accolade of awards and impressive CV, Atelier Kalina delivers modern Czech dining based on the freshest local ingredients and traditional wines. 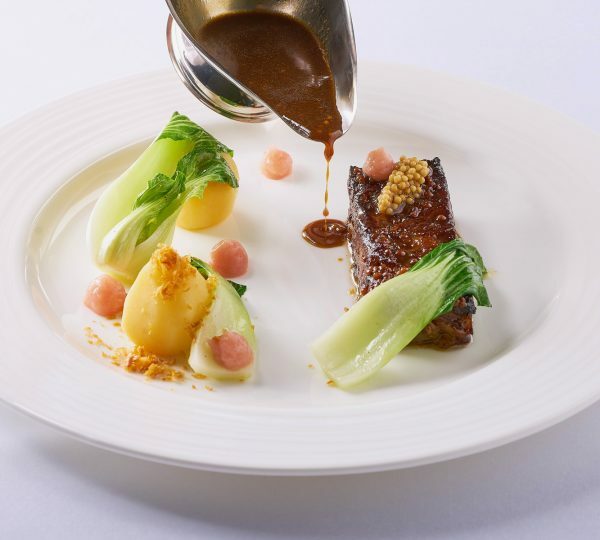 The menu is based on age old recipes handed down from bygone generations, that have been reinvigorated with new influences, dashings of French ingredients, and put together in avant-garde combinations. We dined here on our second evening of staying at the Smetana Hotel, having experienced a two Michelin Star meal elsewhere the night before, and were, despite the bar already being set very high, overwhelmingly impressed by the restaurant’s calibre. 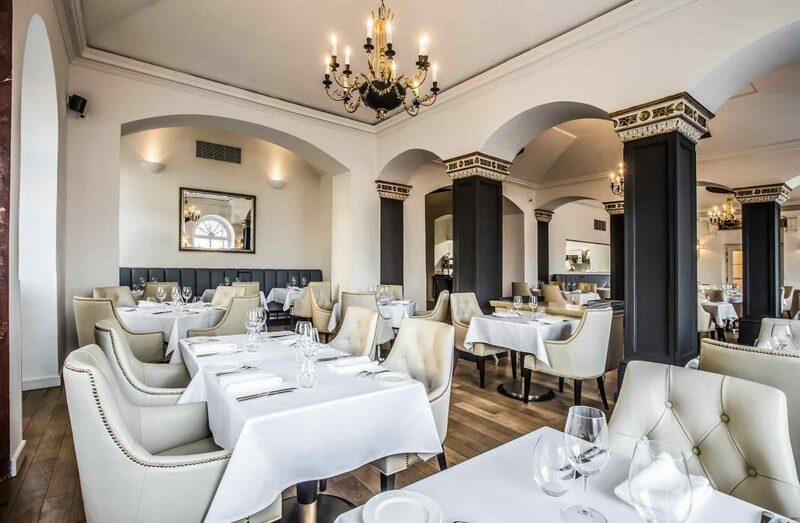 Much like the overarching theme of the Smetana Hotel, the restaurant is reserved, quietly elegant in its excellence and understated in its stateliness. It is filled with this sense of simultaneous grandeur and informality that we sat at our table, overlooking the river, waiting curiously for our menus. Our waiter, the charming Karel, walked us through the menu, showcasing the restaurant’s selection of Czech French fusion dishes like beef tartar, flank steak, sweetbread and fried tongue, rabbit, fish, and veal schnitzel. It seemed, however, that we were not going to need the menu that evening. Head Chef Mr. Kalina – who is frequently at the restaurant meeting and greeting the guests, despite his celebrity status – was present the evening we dined. His charming wit and humorous banter convinced my guest and I to surrender to his recommendations, and so we sat back, with a glass each of champagne Henriot de Reims, blancs de blancs, to start. Our first dish was an unexpectedly delicious bowl of chilled red bell pepper soup served with a mound of bright green basil sorbet. The soup was both sweet yet pleasantly salty, the roasted flavours of the bell peppers adding an earthy depth to the puree, whilst the ice cold basil sorbet added a crunchy, cold herbaceousness that livened it up wonderfully. 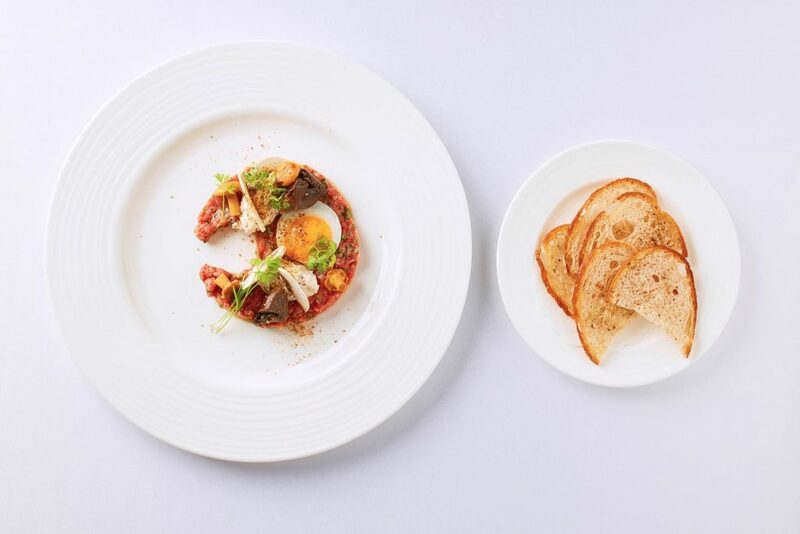 As an amuse bouche, we had a small spoonful of beef tartar with forest mushrooms and quail egg, which is otherwise a starter, to try. 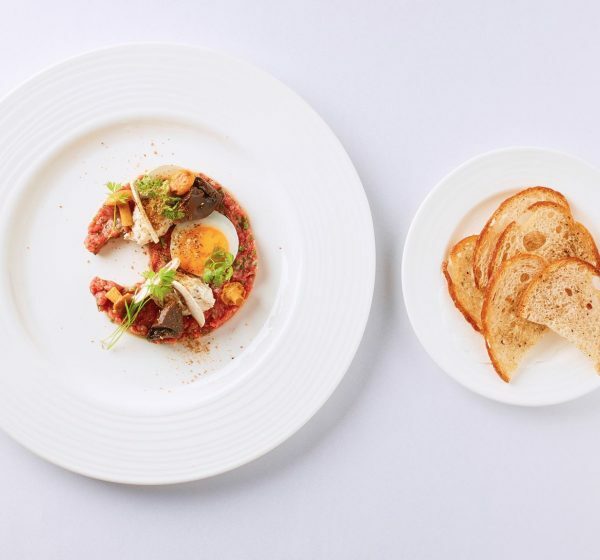 As a beef tartar connoisseur, I was pleased to find Atelier Kalina’s mild and soft in flavour, without the brash, over-spiced flavour that one can often find in tartar. The mushrooms added lovely vegetal notes whilst the quail egg was delicate enough so as to not overpower with the taste of yolk. For the second starter, we had a beautiful bowl of pan-fried mackerel served delicately against some green apple-cucumber sorbet and kefir foam. The sorbet was exceptionally good – fresh and invigorating in flavour, the cold cucumber notes invoking that sense of refreshment one seeks on hot summer days, whilst the kefir foam provided a welcome warm creaminess for balance. The mackerel was juicy and tender, ensuring the dish delivered well as a lovely bowl of summer flavours. To pair, we had a glass of the local wine producer Arte Vini’s Green Veltlinske Zelene wine – a crisp, fresh, white wine full of apple and green fruit flavours, with good acidity and length. For our main, we had a delicious dover sole baked with a nutty, quinoa crust, baked gem lettuce and served on a bed of brown butter sauce. Presented immaculately with colourful ribbons of vegetables atop the lovely roasted lettuce quart, with the crunchy quiona creating a colourful mosaic of black, gold, and white on the fish, this was a wonderful dish that we both thoroughly enjoyed. To pair, we had a French chardonnay, the Domaine de la Folie Rully Clos La Folie, Cote Chalonnaise, which was perfectly buttery and complex for the dish. The second main was an artfully presented portion of sweetbread with fried tongue, served next to a delightful tiny squared egg yolk croquette served with a veal jus. Whilst not a regular purveyor of sweetbread or tongue, I found the dish surprisingly delicious, the fried tongue pleasantly meaty whilst the sweetbread delicate and tasteful. The miniature egg yolk croquette, redolent of Heston Blumenthal in concept and design, featured a tiny little square croquette split in half to reveal oozing warm yolk. Very, very pretty. 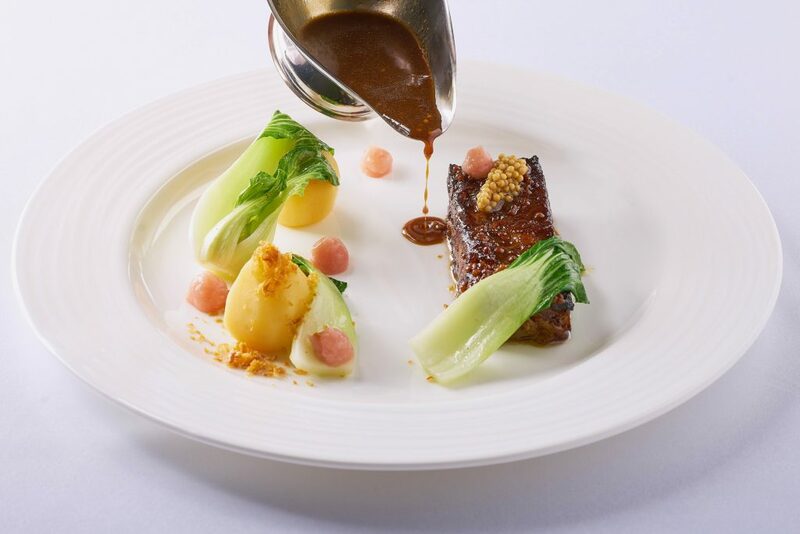 Our third main, was equally – if not more – impressive in presentation, developing the avant garde cuisine. This was a plate of flank steak, served with wild broccoli, potato fondant and chanterelle sauce, served meticulously on a spiral of green sauce, with warm wild mushrooms. It looked, and tasted, fantastic. We enjoyed this with a glass of Bordeaux red, of course. Despite being quite full, we were nonetheless keen to try the cheeses and looked forward to this course. This delicate French cheese collection came as lovely small chunks of various varieties served on slices of crispy, Czech rye bread, topped with apricot slices. To pair, we had a luscious Château Raymond-Lafon. For the desserts, because, yes, we had to try them, Mr. Kalina brought us two exquisitely presented dishes, a quark ice cream served with apricots and chocolate, served delightfully as a children’s lollypop, and a blueberry butter cake served with whipped cream. The quark ice cream, a childhood favourite of mine from Slovakia known as ‘tvaroh’ was not too sweet nor dense, and pleasantly refreshing as a dessert, which balanced out the rich sweetness of the moreish blueberry cake. Both were divine. We finished our meal with a glass of Chateau de Beaulon 12 Year Old XO Cognac, a lovely golden digestif with a glorious nose of freshly baked bread, almond, cinnamon and hints peach, with a decadent, rich fruity taste. Slightly enamoured by Mr. Kalina at this stage for having fed and watered us so well, we finished our magical meal with full stomachs, smiles, and a buzz of overwhelming content. This was a fantastic meal made ever more special by the sense of VIP service offered by Mr. Kalina, his hospitable staff, the artistically presented dishes, and unparalleled quality of flavours. 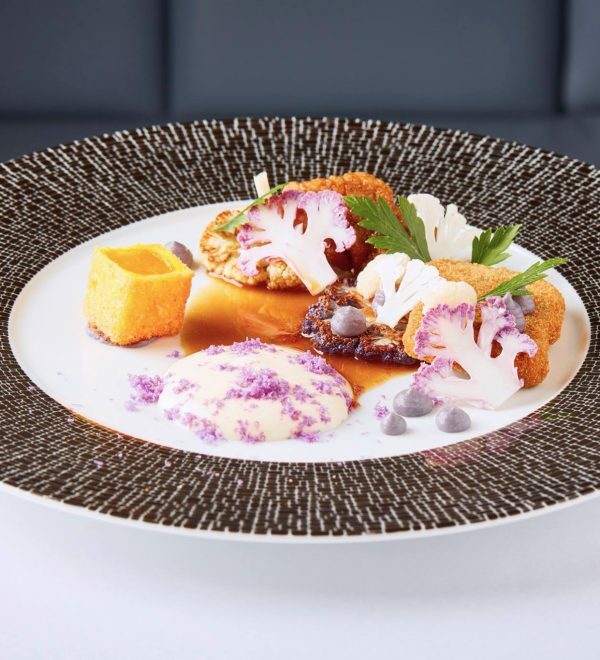 In this sense, Atelier Kalina delivers a sense of effortless wonder, offering ultra high-brow dining whilst showering you with the sense you are eating at a good friends’ private restaurant. We predict a Michelin star in no time.